A High Court in Port Harcourt has slammed a six hundred million naira in exemplary damages on the Economic and Financial Crimes Commission, EFCC for investigating and subsequently declaring two officials of the Rivers state government wanted. 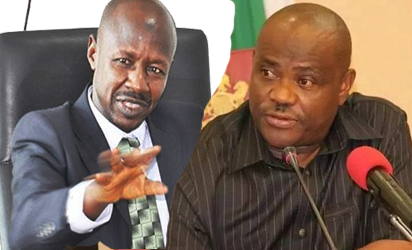 Magu and Wike Justice George Omereji in a fundamental human rights matter brought by the Accountant General of Rivers state, Frederick Abere and a retired Permanent Secretary of the Ministry of Local government Affairs, Lekia Bukpo, restated that the EFCC has no right to investigate the State government or its officials. He added that the EFCC should first vacate the subsisting order made by Justice Ibrahim Buba of the Federal High Court before taking any action on accounts of the State government. Justice George Omereji also said the Letter of invitation of the EFCC is in disobedience to the court order and malicious adding that only the Rivers state House of Assembly has the right investigate the financial activities of the State government. The court however declared that three hundred million naira each be paid by EFCC to Federick Abere and Lekia Biokpo as as exemplary damages. Speaking with correspondent in an interview , Counsel to the two officials of the State government, Dike Udenna said verdict of the court addresses actions of Federal agencies who take the Judiciary for granted.